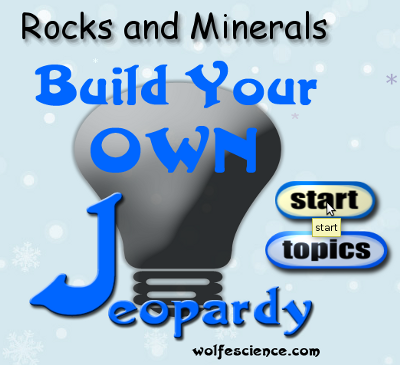 To open a BYOJeopardy board goto http://www.wolfescience.com/byojeopardy. Choose Open on the menu at the top of the page. Then look for the board you would like to play. 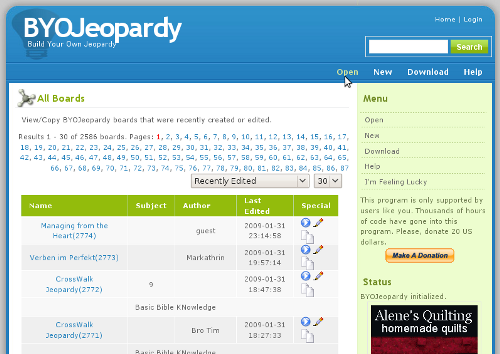 Or use the search box at the top of the page and search for your board. Or if you are the creator, login to the website, then click Open on the menu at the top of the page. Your board should be on the top of the page. After you open the board, wait for the board to finish loading and then click start. Choosing topics displays the topics in an animated fashion. 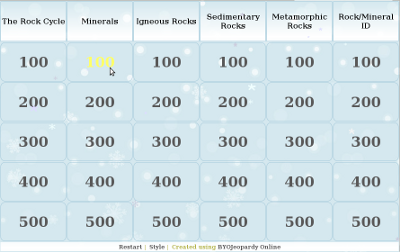 To open a value, click on the value of the clue that the contestant chooses. 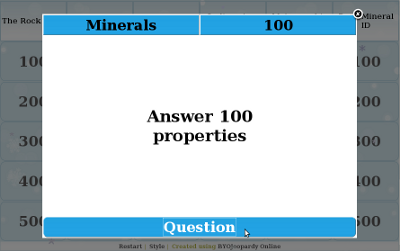 This should open a popup window with either the question (Quiz style) or answer (Jeopardy-like style). 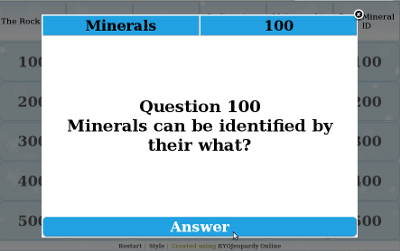 After the contestant has replied, you may see the correct reply by clicking the button on the bottom of the popup. To close the popup window, click on the X in the upper-right hand corner. If you accidently click the wrong clue button, you may reactivate a button by right-clicking the button. Then choose reactivate. To change the style of the board, click style at the bottom of the board. Then choose the board style. The style will immediatedly appear. Finally, click Save the Style to save the style as a cookie for the current computer user. 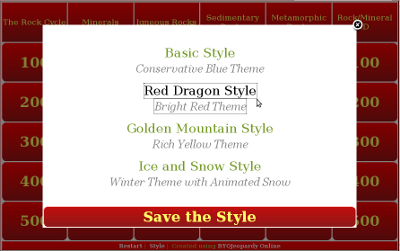 To change the style of the board for all users, you must be the owner of the board and change the style in the Board Info section after opening the board.